This is my desktop, the icon is too big. 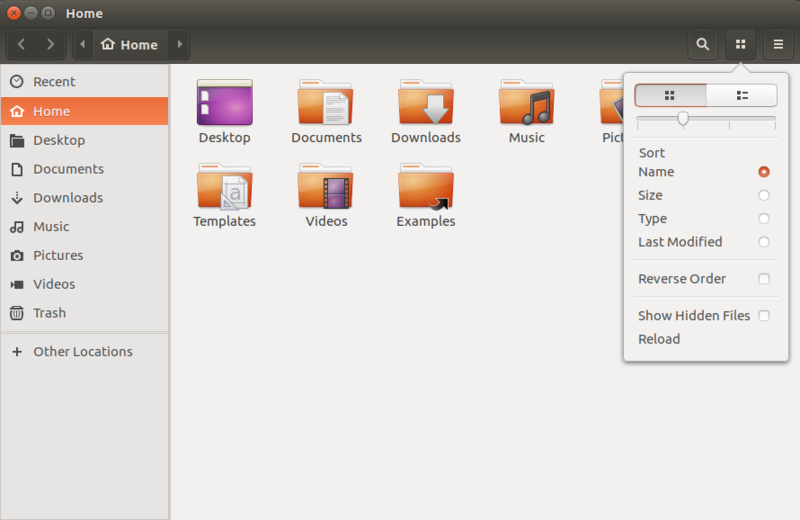 gsettings set org.gnome.nautilus.desktop font "Ubuntu 9"
but the it changes only font size of the desktop icons. I tried to use Compiz, Advance Settings and Configuration Editor but they just have font size option, not icon size option. How to change the desktop icon size? Does this apply to all files put on the desktop or just the one icon you're showing? If the latter, that probably means you did it accidentally. Right click the icon, then select "Restore Icon's Original Size...". The first one, I don't know (yet) how that would happen. Also, maybe you could try gconf-editor. In it, go to apps>nautilus>icon_view. There's a setting for icon size there. Maybe that's what you need. I had the same problem because I had changed the icon size in a window. So I fixed it back from top-right of an open file browser window! Changing icon size in any file browser window will affect all your windows including Desktop! Just open Nautilus. Go to Edit → Preferences and change the percentage of the Icon View Defaults (in German, Symbolansicht) (33%, 50%, 66%, 100%, 200%). Why this setting affects the size of the icons on your desktop will be a mystery forever! But that is the easiest way to resize all icons on the desktop at once without using any tool like gconf-editor. Right click the icon you want to resize. Select "Resize icon..."
Hold-click and drag the handles that appear over the icon to resize it. 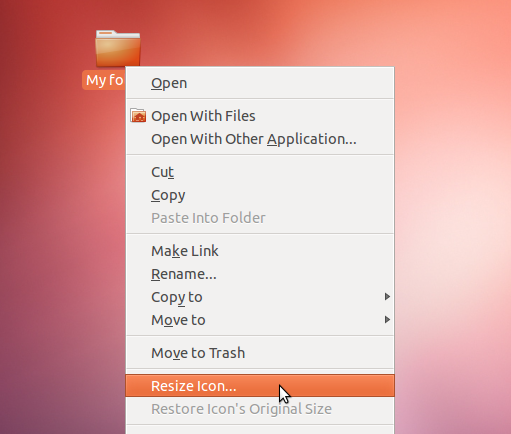 You can revert to the icon's default size by selecting "Restore Icon's Original Size" in the icon's right-click context menu. change default zoom level to 100%. For desktop icons, there is a default size, which could be used as maximum size if you define smaller images than this value. Using gnome-shell, this value is called: org.gnome.nautilus.icon-view thumbnail-size, but under mate, this value is called org.mate.caja.icon-view thumbnail-size. depending on wich desktop environment you're using. Of course, SVG width and SVG height (82px) is computed by my script, and stay smaller than 150. 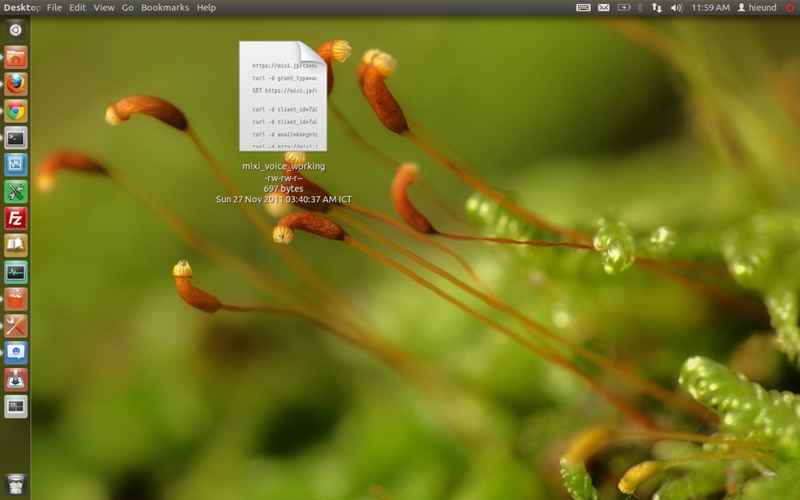 Simplest thing I did was to open file manager(nautilus). Then did a zoom-out using the (ctrl+mouse wheel) combo to decrease the icon size as I needed. By that, the desktop icons also got resized to the same icon size! Looks like the nautilus controls the icon size everywhere - desktop-view as well as the folder-view. under "icon view defaults" change "default zoom level" and see the effect on the items on your desktop. 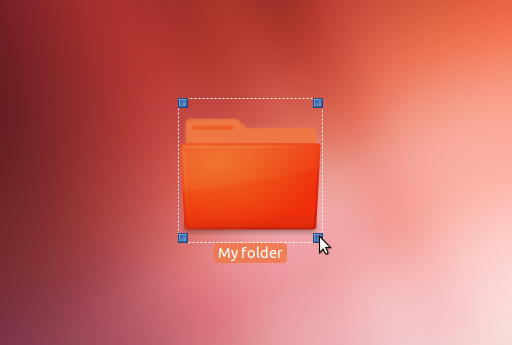 If one opens Files and selects the display type (icons or lists) button, it allows one to change size with the slider. This affects the open window and everything that is on the desktop. I still have to re-arrange but main problem is fixed. I managed to change the size of the icons by open a folder (any folder) with files inside (any type of files) and pressing Ctrl + Mouse Scroll, this change the size for all files inside and outside the folder. Make single icon on desktop larger? How to change the default desktop icon size? How to change the menu icon of mate desktop menu applet? How to refresh an icon that has been changed so the new one shows up?